Tamil Nadu (Tamil: தமிழ்நாடு) is one of the states in India. The capital of this state is Chennai. Tamil is the language spoken in Tamil Nadu. 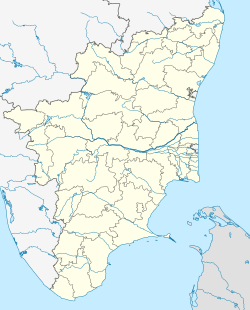 Coimbatore, Tiruchirapalli, Salem, Madurai, Tirunelveli, Thanjavur and Thoothukudi are other large cities of Tamil Nadu. It is surrounded by the Bay of Bengal on the east and the Indian Ocean on the south and also by the Arabian Sea in the west for a smaller area. Kerala, Karnataka and Andhra Pradesh are its neighbouring states. The Tamilians are very proud of their language and heritage. In traditional Indian geography it falls under the South Indian zone. The current chief minister of the state is Edapadi K. Palaniswamy from the All India Anna Dravida Munnetra Kazhagam(AIADMK). Its leader of the opposition is M.K.Stalin, who is also the leader of the Dravida Munnetra Kazhagam(DMK). These two Dravidian parties have been in power alternately in Tamilnadu, since 1967. Wikimedia Commons has media related to Tamil Nadu. This page was last changed on 7 March 2019, at 16:25.